Refrigerator is a device used for refrigeration i.e. to maintain a system or body at a temperature lower than that of its surrounding (atmospheric temperature). The system maintained at lower temperature is known as refrigerated system. Refrigerator works on the principle of thermodynamics cycles and second law of thermodynamics. Thermodynamic cycle is essentially a closed cycle in which the working substance undergoes a series of processes and is always brought back to initial state. The vapour compression refrigeration system (VCRS) is most commonly used in refrigeration. 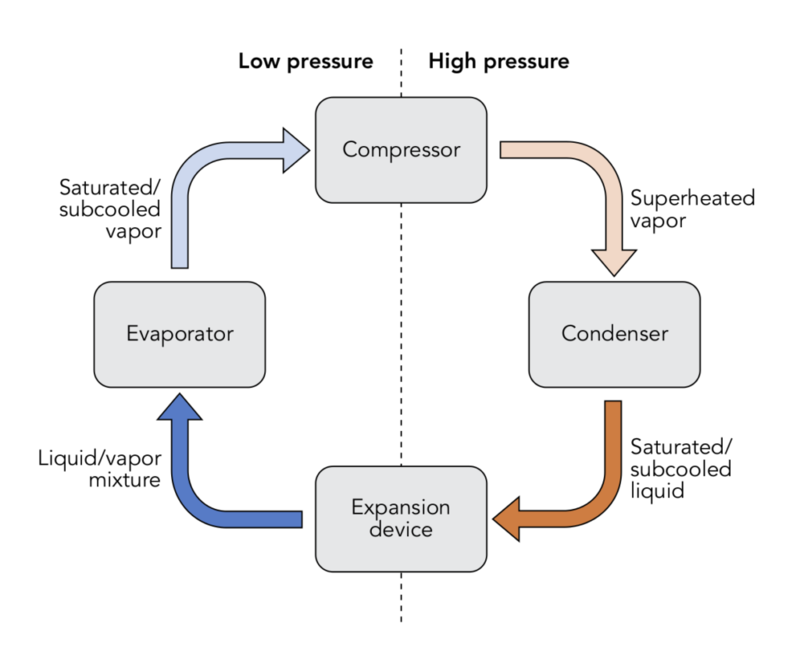 In a vapour compression refrigeration system, refrigeration is obtained as the refrigerant evaporates by absorbing latent heat of vaporization form evaporator (storage space) and liquid refrigerant converts into vapour. The input to the system is in the form of mechanical energy required to run the compressor. Hence these systems are also called as mechanical refrigeration systems. A wide variety of refrigerants can be used in these systems as per different applications and capacities. A refrigerator consists of several components like Compressor, Condensers, Expansion devices, evaporator and some accessories for proper functioning like controls (temperature controlling devices), filters, defrost system etc. for proper working of the device it is necessary to proper matching of all the components as per the requirement and function. Every component performs their own function so it is necessary to assemble all in proper sequence. Compressor is the most important part in any refrigerator. Without it the working of refrigerator is not possible. Compressor is a mechanical device which transfers mechanical energy to working fluids i.e. refrigerant. The function of the compressor is same as heart in human body i.e. heart pump blood in whole body same as compressor regulate the refrigerant in whole unit by increasing the pressure of the working fluid i.e. refrigerant. Refrigerant comes from evaporator into the compressor; the main function of the compressor is to draw the refrigerant form evaporator so that low temperature and pressure can be maintained in the evaporator to extract heat from refrigerated space. After that compressor raises the pressure and temperature of the refrigerant to a level at which it can condense in the condenser by rejecting heat. Condenser is an important component of any refrigeration system. It is a type of heat exchanger. The refrigerant enters into the condenser in a superheated state from the compressor as mention above. It is first de-superheated and then condensed by rejecting heat to an external medium. The refrigerant may leave the condenser as a saturated or a sub-cooled liquid, depending upon the temperature of the external medium and design of the condenser. 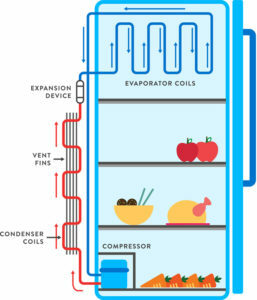 Condenser rejects the heat from working fluid (refrigerant) by means cooling coils made up of copper into the atmosphere used in case of domestic refrigerator. Refrigerant comes from compressor is at high temperature and pressure is cooled in condenser. After condensing refrigerant goes into the expansion devices. Air cooled condenser As per name, in air-cooled condensers air is the external fluid and works as coolant i.e. the refrigerant rejects heat into the air. Air-cooled condensers can be further classified into natural convection type or forced convection type. In natural convection type air is circulated naturally but in case of forced convection some external medium like fan is provided for proper working. Water cooled condenser In water cooled condensers water is the external fluid. Here water works as cooling fluid it extract the heat from the refrigerant. An expansion device is another basic component of a refrigeration system. The basic functions of an expansion device used in refrigeration systems are to reduce the pressure of working fluid which comes from condenser and goes into the evaporator. It also regulates the flow of refrigerant into the evaporator and maintains the flow rate equal to the rate of evaporation in the evaporator. We can regulate and control the temperature of refrigerator using expansion devices by varying the opening as per our requirements. For example we require low temperature in summer as compare to winter session so we regulate the expansion device according to situation and requirement. The expansion devices used in refrigerator are mainly two type’s i.e. fix opening type and variable opening type. In fixed opening type the flow area remains fixed, while in variable opening type the flow area changes with changing mass flow rates. Following are the some expansion devices are used in the refrigerator as per their requirement. 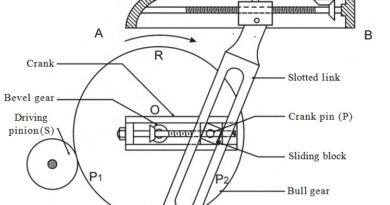 Capillary tube and orifice belong to the fixed opening type, while the other belongs to the variable opening type. It is the storage space or freezer. Refrigerant comes from throttling device enters into the evaporator at very low temp and pressure. In evaporator refrigerant goes through cooling coils. In evaporator heat is absorbed by the refrigerant due to this temperature of the refrigerant increases and liquid refrigerant expends and converts into vapours after that this refrigerant goes to the compressor. 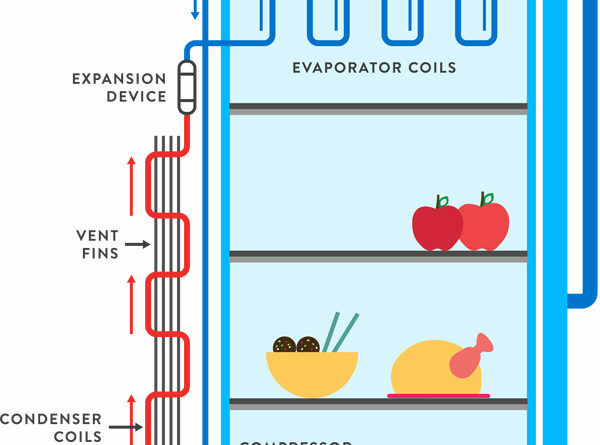 Evaporator works as a heat exchanger between storage space and cooling coils. This cycle repeats continuously. Refrigerants are the working fluids used in refrigerator and under goes in a cyclic process and helps in maintain lower temperature in evaporator (freezer). When the refrigerant enters into the evaporator, it absorbs heat from the storage space and evaporates. This process includes a phase change process which maximizes the cooling effect. A good refrigerant must have some qualities like it should be non-toxic, non-explosive, non-corrosive; non-inflammable and leakage should be non-inflammable etc. Different refrigerants are used as per their requirements. For example: R-12 is used in domestic refrigerator and water coolers. These types of devices are used to control the temperature in the refrigerator. These devices are attached with expansion devices. A thermostat is attached to the evaporator which helps to maintain a specific temperature. As we studied in above article a refrigerator is a device used to maintain the lower temperature than that of its surroundings by absorbing heat from the refrigerated space and reject it into the surrounding. In past time the main use of refrigerator was only produce ice which is used for many purposes but now days the application of the refrigerator increases day by day as the new technology develops. Refrigerator is used in the processing and preservation of food items. Refrigerator is used in industrial applications like in chemical and petroleum industry. Some special kind of applications. Some perishable items like fruits and vegetable are rotten on high temperature because some kinds of bacteria are grow very rapidly in them. The growth of bacteria is reduced at low temperature. So refrigerator extends the storage life of fruits and vegetables. Meat and poultry: These kind of items like fish, chicken and meat also require refrigeration after slaughter because the growth rate of bacteria is very high in these items. Short-term storage is done at 0oC. Long-term storage requires storage at -25oC. Dairy Products: Some dairy products are milk, butter, curd and ice cream. For storage and supply milk is kept in refrigerators. In refrigerators the growth of bacteria is slow down and milk can be stored for two to three days after pasteurization process. To maintain good quality of other dairy products like butter, curd and ice cream they also require refrigerators. Beverages: Some beverages like beer, wines and soft drinks taste good when they are chilled. Fruits juices are also require refrigerators to maintain their nutrition value and taste. While Brewing and wine making refrigeration also requires because these are done by fermentation and fermentation is an exothermic process but these processes should be done at specific temperature. To maintain desirable temperature refrigerators are used. Candy: Chocolate and candy also requires refrigerator for storage otherwise it becomes sticky and it is recommended that it should be stored at low temperature for better taste. Condensation of gases: Gases are condensed to liquid state by cooling process. Liquefied gases can be easily stored and transported. In liquid state gases requires less space. In preservation: Many compounds decompose at room temperature or these are evaporate at a very fast rate like some drugs, chemicals, explosive and natural rubbers by using refrigerator they can be stored for long period of time. In Construction: Setting of concrete is an exothermic process. If the heat is not removed the concrete will expand and produce cracks in the structure. This can be done by cooling sand and water or by passing chilled water through the pipes embedded in the concrete. Ice Manufacture: This was the classical application of refrigerators. Ice was manufactured in plants by dipping water containers in chilled brine for some time. In these plants ice is manufactured in large scale which is used further areas. But these days by using refrigerator we can easily manufacture ice. Ice can be easily manufactured by using domestic refrigerators for domestic use. In medical science: Blood plasma and some antibiotics are manufactured and stored at low temperature. Some other drugs also require less temperature for storage which can’t be stored at room temperature. This is all about refrigerator working along with its application. If you have any query regarding this article, ask by commenting. If you like this article, don’t forget to share it on social networks. Subscribe our website for more informative articles. Thanks for reading it.